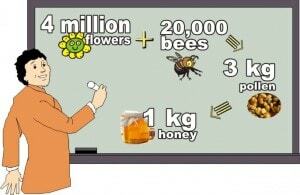 It takes 4 million flowers and 20,000 bees to collect 3 kg of pollen, or 1 kg of honey. And wiki says that for this jar of honey, foraging honey bees have to travel the equivalent of three times around the world! 1. The honey bees go to forage the flowers. They use their proboscis to lap up the nectar found in the flower and place it in their special stomach, called “honey crop” or “honey stomach”. Besides nectar, worker bees also gather pollen. Their whole body is covered in tiny little hairs and when they land in the flower, the pollen sticks to the hairs. The bees gather the pollen with their legs, moving it to the hind legs into their pollen baskets. Which are not exactly baskets, long stiff hairs that curve around a wide flattened section of the worker bee’s back leg. 2. After collecting the nectar from almost 150 flowers and filling the baskets with pollen, the bees return to the hive. On the road, they add an enzyme to the nectar that will start breaking the complex plant sugar down, into glucose and fructose. All the process takes place on this way back to the hive. 3. When the honey bees arrive back to the hive, they pass the nectar to the worker bees. They eat and regurgitated it several times till it gets the right consistency and then store it in the honeycomb cells. 4. The cells filled with honey are left unsealed and the bees start the process of evaporating the moisture from it, by fanning their wings above the cells. The process then repeats as with normal pollen. 1. The collecting bees have to be fed protein supplements, because honeydews lack the protein found in pollen. 2. In cold winter, because honeydew has many indigestibles than light floral have, honeybees can get dysentery and the whole colony can die. The beekeepers have to remove the honeydew before winter comes. 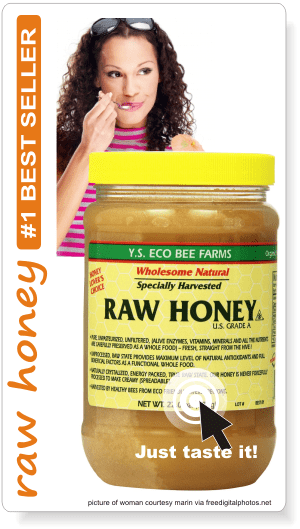 Compared to floral honey, the honeydew honey has a darker color, and a rich fragrance of stewed fruit or fig jam. It is not as sweet as floral honeys and rarely crystallizes. 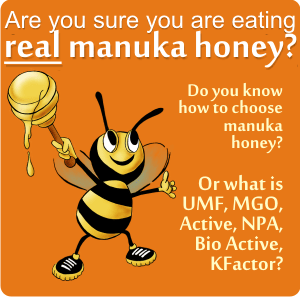 Is honey eaten and regurgitated? It is regurgitated, but not from their digestive tube but from a special stomach that bees have and that functions only for this. 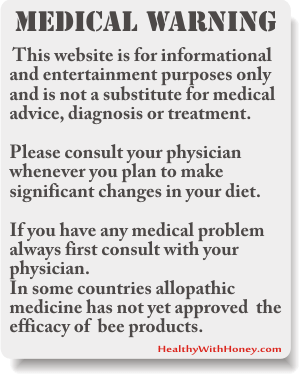 If the honey doesn’t come out of their own stomach we cannot say it is vomit, right? So, no, it is not bee vomit, or bee puke. 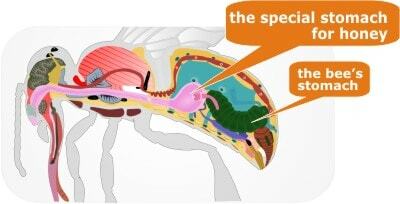 Their digestive system is different than ours. They have an expandable pouch called ‘the honey stomach’ (which we humans do not have) and a valve called the “proventriculus” (which we humans do not have). A honey bee guru Eric Mussen, Extension apiculturist emeritus at the University of California explains that the nectar of the flower is sucked up by honey bees and it passes into an expandable pouch. This is the pre-digestive part of the part of the digestive tract that honey bees use to bring water and nectar to the hive. What’s the temperature in a hive? It’s always around 360 C, the temperature of human body. And remains like that no matter how cold or hot is outside. This is the maximum temperature it’s better to store honey so its nutrients are not destroyed. After the bees seal the cells with wax, beekeepers can come and take the combs, remove the wax caps with a special knife and then put the comb frames in a special machine that will centrifuge the honey out from the cells. Than the honey is strained and bottled. This is how the basic process is done and how I also remember my grandfather was doing. Nowadays there are different methods, technology has spoken here as well. 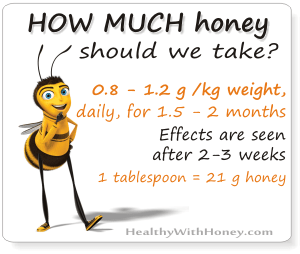 Remember to buy organic honey, from your locals, you can have the guarantee of a clean product and also sustain farmers. You can find them in your area or on their websites. – Jobs of a honey bee. Thank you for this article, really helpful! 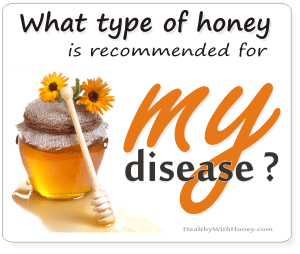 I am planning to become a beekeeper and want to learn more about honey, bees and everything else! I think that they are very smart insects and very hard working!